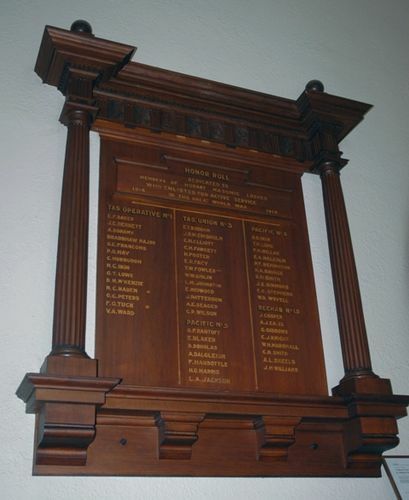 Honour roll commemorates those from the Masonic Lodges in Hobart who served in World War One. The roll contains 52 names. The half-yearly meeting of the Masonic Grand Lodge of Tasmania was held yesterday in the Masonic-hall; the Grand Master (His Excellency M. Wor. Bro. Sir William Ellison-McCartney) presiding supported by the Pro.Grand Master. It was made a suggestion to the Board of General Purposes by the Grand Master that it should take into consideration some means of perpetuating the memory of Tasmanian Masons who had taken part in the war, such as by a roll of honour list for the lodge-room. The Mercury (Hobart), 28th August 1915.